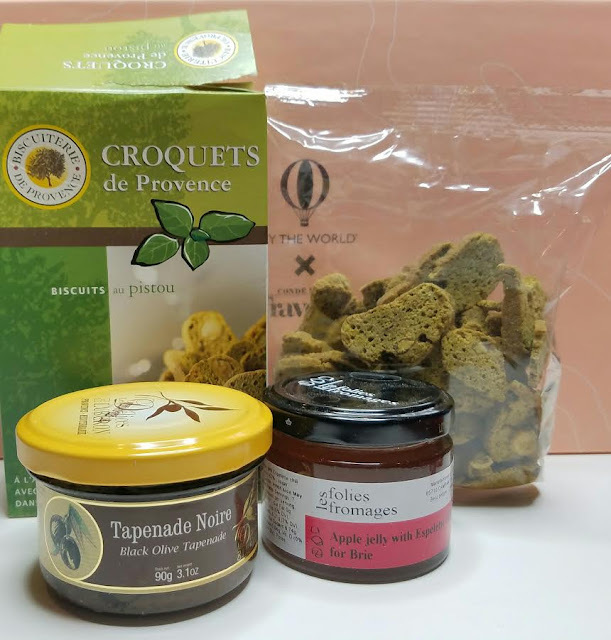 Biscuiterie de Provence Croquet Crackers- The appetizer course is from France. These crackers are the base ingredient and they're made with pistachios. Delices du Luberon Black Olive Tapanade- I didn't know this but tapenade is made with capers! This version is also mixed with black olives and anchovy paste. I'm going to freely admit that I can't stand this stuff but I don't have a very.... advanced? palate. You'd think I'd be genetically predisposed to liking it since I'm (mostly) Greek. But no. Spread this tapenade on the Croquet Crackers. Les Petits Fruits Apply Jelly with Espelette Pepper- This apple jelly is mixed with chili pepper. It's to be paired with brie and used with the Croquet Crackers as well. My mother-in-law likes to use jelly like this over cream cheese, too. 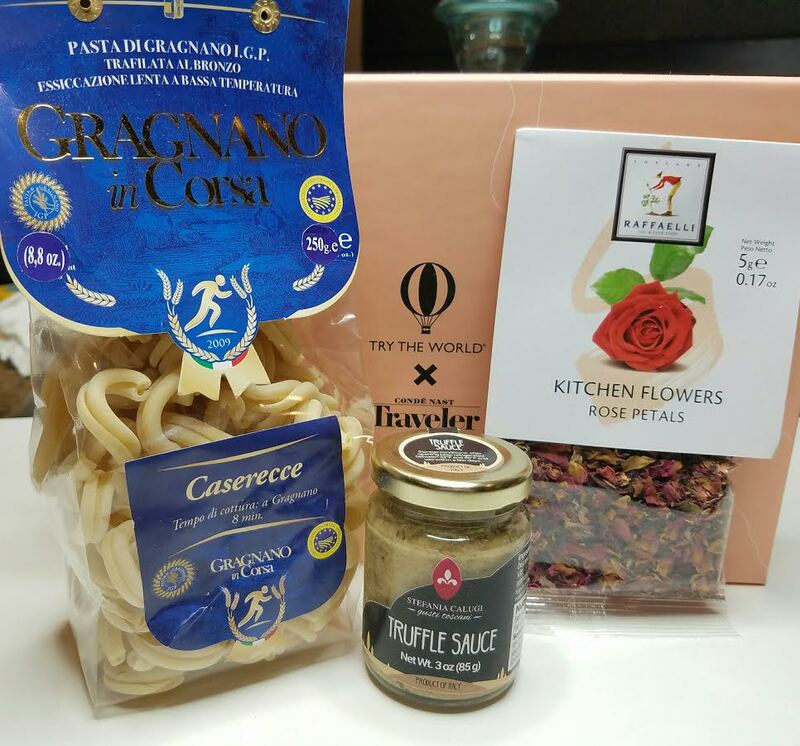 Gragnano in Corse Casarecce- This pasta is made in Gragnano, Italy, an area famed for its centuries old traditions of pasta making. Casarecce roughly means that this is a loosely made, free-form pasta. So the shapes aren't uniform. I like that! This pasta combines with other included ingredients to make the main course. Stefania Calugi Black Truffle Sauce- The Calugi family has been producing truffle products from Tuscany since the 80's, usually with a dog. This sauce is to be tossed into the Casarecce pasta once it has been cooked. Raffaelli Food Edible Flower Petals- The last product from Italy is edible rose petals. They've been carefully dried to preserve their sent and make a beautiful finishing touch. These are to be sprinkled on top of your pasta dish but you can use them over everything from meat to dessert. Siammit Sticky Rice- The dessert comes from Thailand and the included recipe is for Sticky Rice with Mango and Tamarind. Mango is not included since it should be fresh but this package contains the special sticky rice with high starch and the coconut milk that it should be boiled in. Wang Derm Dried Tamarind- To add into your sticky rice, these tamarind have been dried and mixed with brown sugar and Thai spices. You can eat these plain if you like, too. 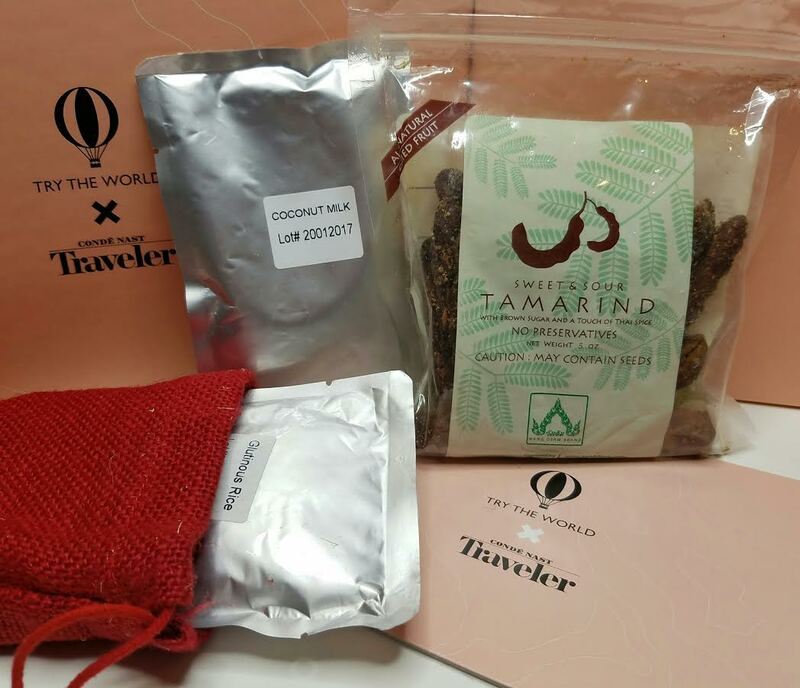 Tamarind have a unique flavor combination of sweet, savory and sour at the same time. VERDICT: I always like how Try the World finds the most unique and interesting ingredients and then manages to create recipes that are easy enough for just about anyone to make. While not everything in this particular box is to my taste, I will definitely be using every ingredient whether for myself or to take as a party hors d'oeuvre. 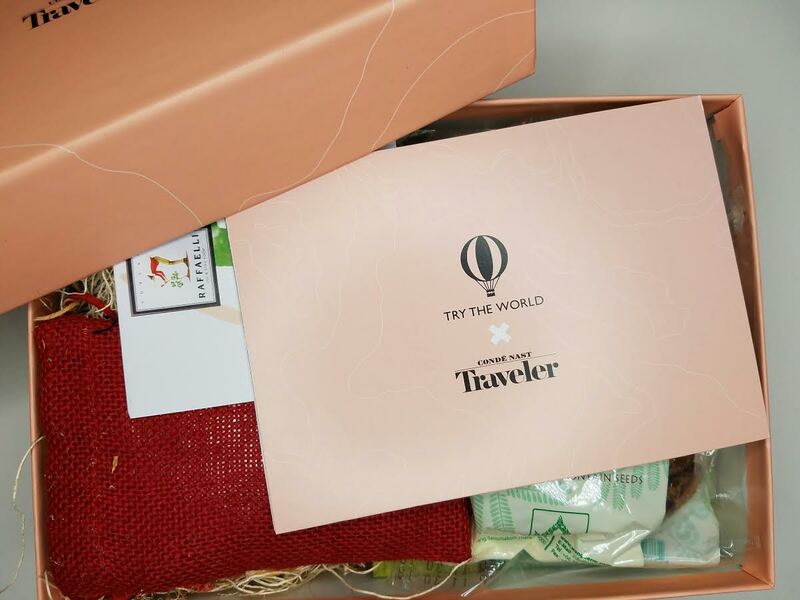 This box is a limited edition and can be found in the Try the World shop as a single box purchase. No subscribing required! You can find it here. 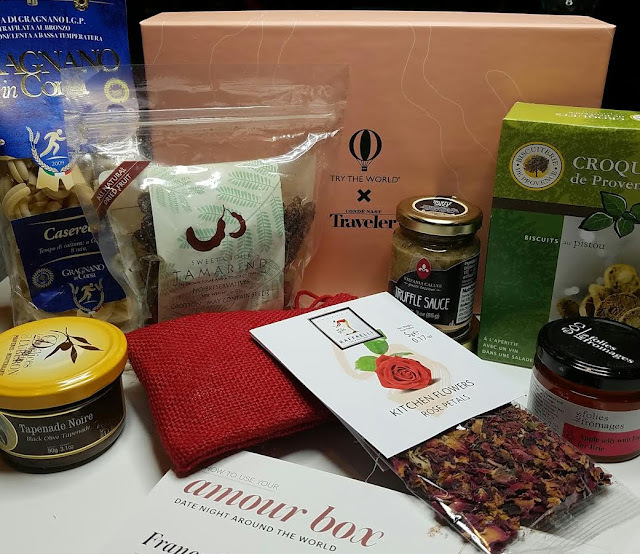 Use code BITS10 to get 10% off this box specifically. If you're just browsing the shop and find things you can't live without, use code AMOUR20 for 20% off (it doesn't count toward boxes).